Today is Pregnancy and Infant Loss Remembrance Day but the entire month of October is devoted to Infant Loss Remembrance. James and I feel very blessed and grateful to be the parents of five young adult sons (ages 19-31). We are also blessed to be the parents of seven precious babies we lost through miscarriage and ectopic pregnancy. This month, we remember in a special way these seven little souls (and intercessors) in heaven. Ecce Ancilla Domini, an article on openness to life. One of the themes of my first novel, Emily’s Hope, is pregnancy loss. “I need to push.” She wanted so desperately not to push, to allow her baby to stay inside of her, and for her to continue to nourish and nurture her child, but her body wouldn’t allow that. She pushed only twice and her small child was born. Emily heard a sound like a kitten crying, then realized that her baby had let out a small, soft, weak cry. The nurse came in with a Polaroid camera and asked if they wanted her to take a photo of their child. Emily nodded as the nurse took a photo of her and Jason and their tiny son. She gazed in awe at this miniature human being and marveled at the fact that even though he was tiny, he was so perfect. His little hands looked like a doll’s hands. She removed the baby blanket and laid his small, warm body on her chest. She could feel his heart beating rapidly. After several minutes, she wrapped him again in the small blue blanket. Then, in an instant, he was still. She could feel that his heart had stopped and he wasn’t breathing, but he continued to feel warm and soft. He looked like a sleeping angel. If you have lost a baby through miscarriage, ectopic pregnancy, stillbirth or infant death, please click on the link above “Baby Loss” for resources and helpful links. Julia’s Gifts (French) and Stealing Jenny (Italian) coming soon! Special thanks to Marie Duval, translator, for the French edition of Julia’s Gifts and Daniela Mastropasqua, translator, and Adelia Marino, editor, for the Italian edition of Stealing Jenny! Want To Win A Free Audio-Book? I’m giving away five free audio-books of Stealing Jenny, narrated by Lisa Reichert. The first five who leave a comment will receive a code for a free audio-book! In this year of the 50th Anniversary of Humanae Vitae (Pope Paul VI, On Human Life), I’d like to share our family’s experience with how this encyclical shaped our decision making with regard to responsible parenthood. I drifted in and out of consciousness in the ambulance. I didn’t have much time for retrospective thoughts, except “Please God, I can’t die. I don’t want my little boys growing up without a mom.” I was bleeding internally, the complications of ectopic pregnancy surgery two weeks previous, and quickly becoming weaker and weaker. Waking up later in the recovery room, I was thankful to be alive. A year later, we were still not pregnant. We felt at peace with our decision to seek another pregnancy and, although disappointed, we trusted that God knew what He was doing. Eventually, we stopped charting. Another eight cycles went by with no pregnancy and I began to sell off most of my baby furniture. A few weeks later, it dawned on me that I hadn’t had a period in six weeks. The next morning, I took my temperature and it was 98.9. After 18 months of saying no to us, God was saying yes and blessing us with another eternal soul. I was thrilled that another new life, the fruit of our love, had begun, and would be sheltered lovingly in my womb. At 30 weeks, our unborn baby was six pounds and I had already gained 50 pounds. That might not seem like much, but with my four-feet-nine-inch frame, it meant that I could not drive (the seat had to be pushed back so far to allow for my large stomach that my feet couldn’t reach the pedals) and I could not walk the last six weeks of the pregnancy. Our son, Adam, was born eight weeks later at nearly ten pounds. The pro-life Catholic doctor who delivered Adam by C-section told me that we could try for another baby someday, but that the pregnancy would again have to be closely monitored. Three years later, our youngest son, Paul was conceived after only one month of trying and born just two days before my 40th birthday. Although we could have used NFP to avoid pregnancy permanently and to limit our family to three sons, we chose to listen to our hearts, to answer God’s calling, and to seek more children. When I consider that our two youngest sons (now ages 19 and 22) might possibly not be here today, my heart becomes heavy. Both are unique, talented and amazing human beings who have already given so much to our family and to society. I am grateful to God – and to Blessed Pope Paul VI – because I can’t imagine our family — and our world — without them. Our society has become a culture of death. This is most especially evident now that Ireland will be reversing its anti-abortion laws because of a recent vote. Morality is not dependent upon the majority rule. Murder of the unborn child will always be wrong. Here in Canada, since there is no law against abortion, killing an unborn child is legal right up to the moment of delivery. Some contraceptives are actually abortifacient (cause early abortions), rather than preventing conception. In certain parts of the world, pre-born baby girls are being killed by the thousands simply because they are female. Never underestimate the power of prayer and fasting. Daily Mass, the daily rosary, a weekly fast (especially on Fridays) and other forms of prayer have more effect than we can possibly realize. Spiritually adopting a baby in danger of abortion (http://www.spiritualadoption.org/) is a beautiful way we can build the culture of life. Try to recite the Litany of the Saints daily. We can never know the effect that our prayers have had (until we die), but be assured this is one of the most important ways to build a culture of life. All Christians (not just Catholics) are called to practice chastity and be open to life. Being chaste before marriage and practicing marital chastity (faithfulness) is essential for building a culture of life. Contraception is “intrinsically evil,” (CCC 2370) it harms marriages and separates couples physically and spiritually. Natural Family Planning (www.ccli.org) is a safe, moral and effective way to avoid and plan pregnancies. Make sure that your voice heard. Register to vote and vote often and whenever the opportunity arises. This can be no more evident than in our upcoming presidential election. Although I have been living in Canada for 36 years, I am still a US citizen and I have continued to vote in US Federal Elections. Performing the corporal and spiritual works of mercy will also help to build a culture of life because these works will help build spiritual character. When we are closer to Christ, we are closer to a culture of life. The corporal works of mercy, based on Matthew 25:31-36, are: 1. feed the hungry 2. give drink to the thirsty 3. clothe the naked 4. shelter the homeless 5. visit the imprisoned 6. care for the sick 7. bury the dead. The spiritual works of mercy, commanded or encouraged in many places Scripture, are: 1. admonish the sinner 2. instruct the ignorant 3. counsel the doubtful 4. comfort the afflicted 5. bear wrongs patiently 6. forgive all injuries 7. pray for the living and dead. 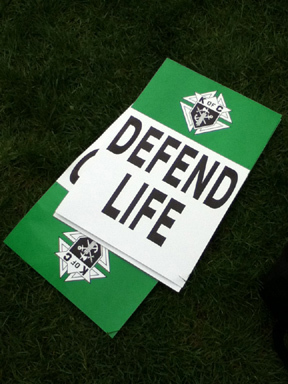 Attend peaceful pro-life events like the National March for Life (in the USA it is held every January; in Canada, it is held every May), the Hike for Life and other Pro-Life rallies. It’s important to be patient and charitable when speaking to, interacting with or debating with those who are pro-abortion. Many of these fiercely pro-choice women have had abortions. St. Teresa of Calcutta said, “If you judge someone, you have no time to love them.” Try not to be judgmental of the person (always separate the person from the sin). In some cases, these women were coerced by their partners or parents (those who should’ve been protecting them) into having an abortion. Being a good example of Christian virtue is another great way to build a culture of life. Volunteer at a pro-life women’s shelter, embrace faithful Catholicism and donate money to causes that build the culture a life. If each of us does our own part, we can help to rebuild a culture of life, one that is an antidote for our current culture of death. Today, my husband and I celebrate 36 years of marriage. Happy anniversary to my husband, James, who has held my hand through the births of our five sons, cried with and consoled me through seven miscarriages, has been faithful to me through good times and in bad, in sickness and in health. He makes me laugh with his goofy impressions, and I am in awe of his amazing talents. I am truly blessed and honored to have him as my sacramental partner in life, and I will be forever grateful to God for bringing us together in the most unusual circumstances! And how do NFP couples celebrate their anniversary?